We’ve been getting a lot of questions about using social login to register bikes. We know that social networks can be a hot issue for a lot of people, and so we thought it would be useful to explain what social login is in greater detail, why we require it, and what you can do if you are concerned about your privacy. We believe that mega-sites who are deeply invested in elaborate password security systems can do that better than we can as a small team. We strive to build a high-integrity community of users. The anonymity you get through email type login on sites like Craigslist simply doesn’t engender the kind of community or trust we’re aiming for. Time is of the essence when your bike is stolen, and we believe it’s faster to sign in with a social network that you are likely already signed into than to have to remember an email address and password that you haven’t used in months or years. To start with, when we say social login, we simply mean that we use the username and password service of popular social networking sites (we currently support Facebook, Google+ and Twitter) to authorize access to your account on our site. Despite how that may sound, this does not mean that we get your social network password or your friends list. When you click the login button on our site or in our app, we say “Hey Facebook, someone wants to log in. Can you tell us if they are who they say they are?” Facebook takes over before you enter your user name and password… that doesn’t happen on our website. Once everything looks copasetic, Facebook let’s us know that your log in was successful and gives us access to your “basic” public data. Nothing private is shared with us, so nothing private from your social account is stored on our servers. That’s the first thing we like about using social login. Not only does it mean less boring code to write, but it also means even under duress, we can’t accidentally spill the beans. We want you to have the best protection on your password. We could have gone and built our own user login service and invest a ton of time building software to try to make sure we stay one step away from the pirates. But frankly, we are a small team with a lot on our plates. There are only 10 of us here at Project 529 HQ. And building a secure system to receive and store passwords — basically rebuilding the wheel — instead of tackling the problems of how to have the best FREE bike registration and recovery service available was honestly a pretty easy choice. We knew that not everyone would sympathize with our choice, and certainly we aren’t happy to lose them as customers, but the cost to do so would mean delays in our other cycling related services that we didn’t want to sacrifice. We really don’t want to be one of those Company Got Hacked headlines that seem to be in the news almost daily. By using Facebook, Google+ or Twitter to log in, you know you have HUGE companies with enormous teams (and budgets and reputations) protecting your password. We don’t think that most bike thieves spend their time trying to hack into Facebook (they might trying to get into our site), and we don’t think that hackers that do get into Facebook are going to spend much time trying to use that information to get into a bike registration service to find information that you’d probably put on a missing bike poster anyway. Just like with bike locks, there are no undefeatable solutions. But these networks have dedicated teams working on user security and are better equipped to deal with those issues than we are. So, we think it’s in the best interest of everyone if we simply don’t store your password. By using social login, we do not see or store your password, ever. So there’s zero chance of someone stealing it from us. An account attached to a social network is more verifiable and credible than an account attached to an email address, which means we are building a more legitimate community of cyclists. The fact is, that there are ways for bike thieves to potentially game any registration system, and we want to make that as hard as possible. Now, how many times can you do that before we start going, hmmm. That person sure has a lot of bikes. Something fishy is going on. Alarm bells start ringing. And because you are a smartypants bike thief, you get tricky. You decide to create new accounts for each bike you steal. It’s ridiculously easy to do that with a service that uses email-only login. You can do that in just a couple of seconds, and the service you are using would have no way of knowing if the email is brand-spanking new or if you’ve used it forever. With the 529 Garage, you have to attach a social network. So, first you’d have to create the fake email account, and then you’d have to create a fake social network account and go through whatever confirmation process they require. It’s a lot more work to automate. And, when you use that network to log in, we get a little bit more information from that social network account than we can from an email address, like when the social network account was created. Accounts created within seconds of registering a bike with no friends or followers? In the case of a dispute, that can be used to establish credibility (or lack thereof). We think that’s a decent sized speed bump to put up in front of a thief. Chances are, it may be a while since you logged in with our site once you’ve registered your bike. In the event your bike is stolen, you’ll want to press our app’s Alert button as quickly as possible. Will you remember a password you set over a year ago? Will you remember what email address you even used to sign up? Maybe, but you’ll be able to log in far more quickly with a service you use regularly than one you’ve logged into only once or twice. If your bike is stolen, your social networks will be an important resource in spreading the word to keep an eye out for your bike. Part of our Alert system makes it really quick to post to your network (with your permission, always, of course). Logging in with the network just takes one more step out of the process. Time is of the essence when it comes to bike theft. So, you say, you get that, but you are still concerned about your privacy. Yep, we are too. You are right if you are wondering why we’d need access to your friends list. We don’t. 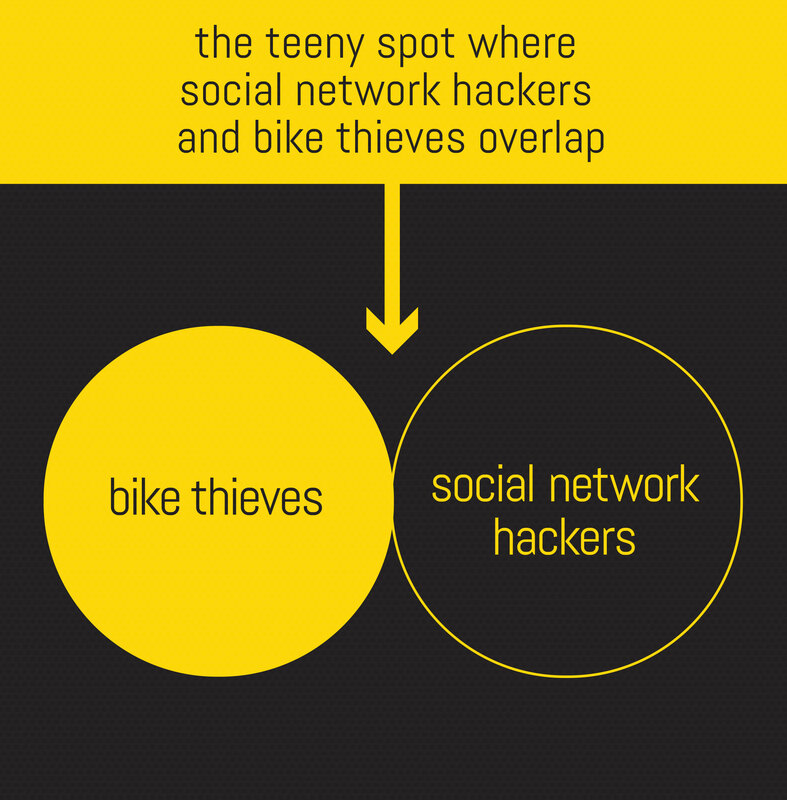 We can share your bike just fine with your network without knowing who we are sharing with. And because of that, we don’t read your friends list. Even if your friends list is completely public and delivered to us on a silver platter. We make a point to only read information from your network that is relevant to our service. Just because we think it’s more friendly to be able to address you by your name on our site and in any emails we send you. This is the email address you’ll see after you log in for the first time that we ask you to confirm. We do need some way of getting in touch with you, in case our service changes, or to tell you other important stuff (like tips on your stolen bike), but you don’t have to use the one from your social network. You can change it to any valid email address. We just thought we’d save you some typing. Having your “home base” in our system helps us customize the hot sheet and other location based notifications just for you. Some of the other bike registration services seem to be keen on sharing bikes stolen in Tokyo with cyclists in Dayton. We don’t think that’s a good use of your time or your inbox. You’ll notice that all of these say “if it is available from your network” That’s because ultimately, it’s you who determine what our app can see about you. We aren’t evil geniuses trying to game your privacy, but some sites may be, and the privacy settings of most of the networks can be really hard to find or confusing. To help you out, check out our tips on how to secure each of your social networks. We’d love to introduce you to J, our founder, who is also not much of a fan of social networking and isn’t active. You’d dig him. Frankly, none of us are big in the social network circuits. We’d rather be out riding our bikes. If you want to use the site, but really don’t want to do social network, we still recommend creating one of the free accounts we support and simply not using it as a social network. If you lock it down really tightly, don’t post to it and don’t follow anyone from it, you’ll have an invisible social network account with no information of import to anyone. If you already trust Google with your email by using a Gmail account, then enabling Google+ with locked down privacy settings wouldn’t be any more of a risk. Are there other networks we should add that you’d prefer? Microsoft Live or LinkedIn for example? Let us know. Well, that was a big wall of text, wasn’t it. We know we won’t win over everyone with our reasoning, but we hope it helps you understand why we’ve chosen to go with social as our login solution, and maybe helped make your social network data a little more secure in the process. I’m not on or do I have any social media accounts. Does that leave me out? For the reasons we point out in this article, we do require social login for our service. It’s free to create a social account though, and we have tips on how to lock them down securely so that there is no need to worry about people getting data that you don’t want them to have (see this post: https://blog.project529.com/secure-your-social-network/). I don’t like and won’t use sites that force social login. I’ve implemented it as an option for a site and have seen first hand how much stuff it shares (facebook in this case). The marketing team was drooling over the data payload, we devs were really uncomfortable with it. Bikeindex.org doesn’t force me to use social login. I’ll use them instead. Hey Ken, thanks for the post. Like you, we’re pretty shocked by how much information Facebook has and how few of their users have managed their privacy. That was our impetus in writing this post. Unlike your former employer, we are NOT accessing all of the data made available – as stated above, we’re simply using name, e-mail and postal code if this data is available to us and nothing else – and that, simply as a convenience to our customers. The real motivation is to minimize the “garbage” and the “gaming” that you see on many sites out on the net that have loose membership requirements and no validation. We want our registry to be as robust as possible, our hotsheet not to be littererd with spam, opinions and advertisements and we want to build speedbumps to keep the thieves and bots out. We’re not religious about social login, we’re simply trying to prevent the problems above. We’d love ideas you might have on how we could do a authentication system that could preserve the goals that we’ve set out for the system. Sorry. Social login is a show stopper for me too. For the same reason that I don’t use the same password for more than one site, I don’t want multiple sites authenticating from a single login. If FB, Twitter or G+ is hacked, I don’t want to have to track down what other accounts may be affected. Also, most social logins require third-party cookies which I block in all my browsers. Lara, I am sure that you are all about privacy. The issue with social logins is that those sites TOS/ Privacy Policies gives those sites the legal capability to collect your history/ cookie you/ etc for OTHER sites you use after your site (for instance) EVEN IF THE USER DOES NOT LOGIN TO THOSE SITES USING THEIR SOCIAL LOGIN…QUITE SIMPLY IF THE API OF Facebook, for instance, is on another site then you have given them permission to track, target, etc you and they OWN the data…not you the user and not you the proper privacy correct website. I understand what you are saying in your post, but it is naive and does not look around the corners where while thinking one is safe on privacy matters the user has in fact given away EVERYTHING. A Trojan Horse is not a strong enough description of what this unleashes.